Army SSgt. David J. Whitcher - Run for the Fallen New Hampshire, Inc.
David enlisted in the New Hampshire National Guard in 2008 as a carpentry and masonry specialist. 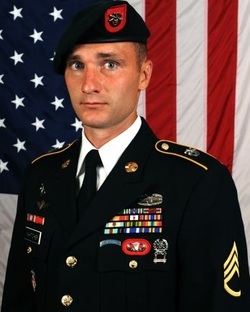 He was a veteran of two deployments to Afghanistan as a member of the NH National Guard. In 2013, he came on active duty and was assigned to the 6th Engineer Battalion, 2nd Engineer Brigade, Fort Richardson, Alaska. David was married to Victoria and had a son, David Jr. Before he was stationed in Alaska, the couple together built a solar-powered, off-the-grid tiny house, which they towed 4,000 miles from the New Hampshire to Alaska. In 2014, David volunteered for Special Forces training. He graduated from the Special Forces Qualification Course in 2016. He was a student in the Combat Diver Qualification Course (CDQC) assigned to Company C, 2nd Battalion, 1st Special Warfare Training Group, U.S. Army John F. Kennedy Special Warfare Center and School. Prior to his attendance at CDQC, he was assigned to Company C, 2nd Battalion, 7th Special Forces Group as a Special Forces engineer sergeant. His military education includes the Carpentry and Masonry Course, Heavy Construction Operator Course, Basic Airborne Course, Combatives Level One and Two, Combat Life Saver Course, Basic Leader Course, Advanced Leaders Course, Winter Mountain Warfare, SERE Level C, and the Spanish Language Course. His awards and decorations include the Army Commendation Medal (3rd award), Army Achievement Medal (4th award), Valorous Unit Award, Meritorious Unit Commendation, Good Conduct Medal, National Defense Service Medal, Afghanistan Campaign Medal, Global War on Terrorism Service Medal, Armed Forces Reserve Medal, NCO Professional Development Ribbon (numeral 2), Army Service Ribbon, Overseas Service Ribbon, NATO Medal, New Hampshire State Active Service Ribbon, Expert in Competition Bronze Pistol Badge, Expert in Competition Bronze Rifle badge, Governors 20 Tab, Combat Action Badge, Parachutist Badge and Special Forces Tab. David is survived by his wife Victoria, son David, and his mother Kathleen, brothers Matthew and Danny Whitcher, Michael Robbins, sisters April Messer, Rebecca Whitcher and Ruth Koloski and his extended family. He was predeceased by his father, Horace "Bud" Whitcher in 2015 and one sister, Laurel Coronis.